The "oasis of love" we've found is not just for a few. It is not about a church. It's getting to know Jesus, our oasis, and finding a place in Him where we live above the circumstances around us. We become part of the family of God and find a place of spiritual refreshing, which God provided for everyone! We also provide a good, safe, interesting place for youth. There are activities year round for all ages, including summer camps with excellent instructors. In 1980 Myrna Speck was commissioned to start a branch church in the Huntingdon area under the auspices of our Bishop. She and her family had been actively involved in their local church, founded by Myrna's parents, in a small town 25 miles away from their Huntingdon home. For many years Myrna taught Bible Classes in her home. The classes steadily grew, thus the need for a work in Huntingdon. The following year, in May of 1981, she was ordained Pastor of the Oasis of Love Church in Huntingdon. Prior to his death August 2, 1999, Rev. Speck's husband, Bursie, faithfully ministered alongside his wife. He was overseer of construction of the buildings and grooming of the grounds. shepherd of the local flock. Pastor Myrna has inspired many through Upper Room Youth Camp, Understanding God Bible Class, various other Bible Studies, Marriage and Family Classes, daily ministry, outreach to the community and other churches. stand behind the vision God has given for the Oasis of Love Church of Huntingdon. Rev. Art Speck was raised in the church under the tutelage of his Grandmother and Grandfather, Bishop Elvina Miller & Rev. Harrison Miller. He also thrived under the ministries of Rev. Ben Foy, Rev. Kathy Speck, and his mother, Rev. Myrna Speck. As the youngest son of Rev. Myrna and the late Bursie Speck, he has followed his mother's footsteps and answered the call of God. In 1990, Pastor Art was installed as the Youth Leader in the Huntingdon work and was already fully involved in every aspect of ministry under the tutelage of his mother. His multitude of duties included Administrator, Business Manager, teaching classes, Pastoral mentoring and other church ministries, and Upper Room Youth Camp Director. In 1991, Pastor Art began making trips to Africa with his grandmother, Bishop Elvina Miller. He received much valuable training from Bishop Miller, preparing him for his future role in Ghana. In 1998 he was ordained Pastor and also commissioned Director of the Oasis International Training Centre in Prampram, Ghana, West Africa. Since then, he spends much time in Prampram, fulfilling his role as director. Pastor Art continued to help his mom, eventually taking over most of the duties that she carried out during her tenure as Senior Pastor. Pastor Art was officially installed as Senior Pastor of the Oasis of Love Church of Huntingdon in May, 2014. When Dotty Poore moved to Huntingdon from South Carolina, a mutual friend introduced her to Pastor Myrna Speck who was teaching a Bible class, Understanding God, in her home. She began attending the study and found it to be a life-changing course. After seeing an advertisement in the local newspaper that a new church, New Covenant Fellowship, had begun in Huntingdon, excitement sparked in her heart! In February of 1981 she began regularly attending New Covenant Fellowship (now named The Oasis of Love Church in Huntingdon). As she availed herself to help at the church, she found herself serving as church secretary. In 2003, Rev. 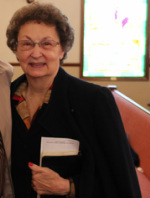 Dotty Poore was ordained into the ministry of the Huntingdon Oasis. Pastor Dotty has faithfully worked hand-in-hand with Pastor Myrna and has been an integral part of the Huntingdon Oasis. In addition to the many facets of office work, she teaches and ministers the Word of God, and directs Kid's Adventure Klub, a weekly time-release Bible club for elementary students at the Southside Elementary School. Please contact the church for instructions as to how your child may join the others who come each Tuesday at noon for Kikds Adventure Klub.